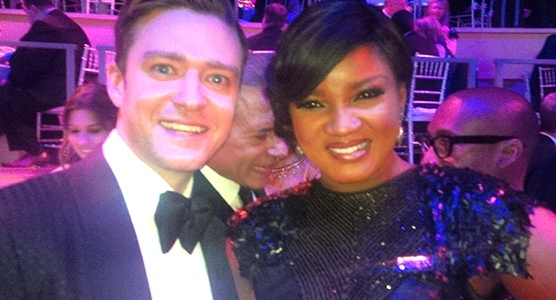 In April 2013, screen goddess Omotola Jalade Ekeinde (pictured above with Justin Timberlake) was honored as one of Time Magazine 100 Most Influential People in the World. According to Omotola, it’s an achievement that will forever linger in her memory. She tells Encomium magazine:“It’s a great honour. Sometimes you really don’t know your worth and people around you may just take you for granted. I was selected for a number of reasons. From what I was told, they watch a lot of my movies up there. The person who wrote my profile is actually the movie critic for Time magazine. He had been introduced to some of my movies. He also got to know about my other activities, including human rights activism and others. They also conducted opinion polls from those that follow what’s going on in Nollywood. I think the opinion of the organisers is based on this. I wasn’t the only person picked from Africa. There was another guy from Egypt but he’s white and lives in the US. He is a blogger. I was the only black African honoured and out of the 100 honorees, they only picked 20 of our portraits displayed in the Time Work of Fame, and my picture was there. Not only that, it was given the pride of place. One thing I noticed was that from the moment I stepped onto the red carpet, I was treated like a queen. I was on one of the best tables, sitting with US Vice President, Joe Biden and others. I think it was a good moment for Africa. It was one of the few moments I felt like Africa has arrived.